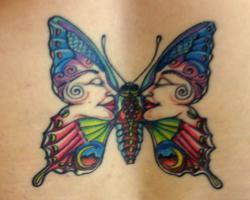 Butterfly tattoos are a popular choice for women for many reasons. In addition to being feminine, delicate and alluring, they offer a lot of room for design customization. Not only are they beautiful, butterfly tattoo designs are versatile, allowing for plenty of experimentation with color and shape. For example, butterfly tattoos can have realistic or imaginative designs. They can also be in with other symbols such as flowers, leaves, fairies or flames to create a unique look that is all your own. Possibly the most popular style of butterfly, the open-winged look provides the most design options. An opened-winged butterfly can take the form of a cutesy, feminine tattoo or a work of art, depending on the wearer's desires. The recipient can pick the curvature of the wings and antenna appearance in addition to selecting the pattern, style and colors. Open-winged butterflies work best when you can give them space to take flight. They can be placed anywhere on the body, but consider placing them on the back, upper arm or shoulder to give them room to fly. 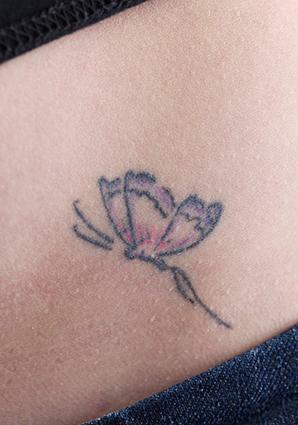 Closed-wing butterfly tattoos are a less common than open-wing designs, but are still quite popular and attractive. Closed-wing butterflies are an ideal choice for those who want to get a small tattoo, though there are fewer design choices with this style than an open winged design. For added interest, consider offsetting the wings slightly. With this option, one wing will show above and behind the other, while still not showing full flight. 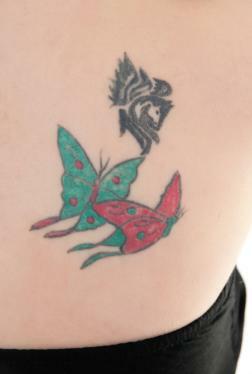 These tattoos are often placed on areas of the body that give the butterfly the appearance of being perched, such as the ankle or above the hip. Beautiful, exotic, hypnotic. All of these words can be used to describe butterfly eyes tattoos. Not sure if you've seen one before? Picture a beautiful butterfly, but replace the circles on its wings with human (or animal) eyes. The style is far out, but not far fetched. The design is drawn from nature itself. Some butterflies have developed a particularly interesting defensive mechanism. The circles on their wings look like a large pair of eyes. This tends to confuse predators and scare them away before they have a chance to attack and eat the butterflies. The Peacock butterfly is a good example of the inspiration behind the tattoo design. There are over 700 types of butterflies in North America alone, so there are many options when you choose a tattoo design that depicts a specific type of butterfly from nature. Size this kind of tattoo so that it is similar to the actual size of the type of butterfly you are getting, and match the colors to what occurs in nature. Try placing a tiny Little Blue butterfly tat behind one ear, or spreading out an Owl Butterfly tat across your shoulder blades. Getting a butterfly in the style of tribal artwork or adding butterflies to a tribal armband is a popular tattoo option. Typically, tribal art tattoos are less colorful then traditional tattoos and the butterfly may be solid black. Tribal butterfly tattoos work well in any size, but the more intricate the pattern, the larger you may want to consider going. Small tattoos may lose a lot of detail, particularly when done in one, solid color. Tribal butterfly tattoos are ideal for anywhere on the body, but work well in areas that allow for symmetry, such as the lower back or between the shoulder blades. Butterfly tattoos do not have to mimic a natural butterfly; instead they can take on any characteristics you desire. This may mean placing different symbols in the "eyes" of the butterfly's wings, or creating faces or images within the wings themselves as a sort of "hidden image" for the viewer to discover. You may even want to combine different images, by putting butterfly wings on a fairy. Depending on the amount of detail in the design, you can display an imaginative butterfly anywhere. Try placing a tiny one on your wrist or foot, or locating a larger one on your lower back. Why stick to one butterfly, when you can use several? Some types of butterflies are frequently seen in pairs or groups in nature; try duplicating this on your skin. Your butterflies can be all one type and color scheme, or you may choose to give each one a separate color for added depth and interest. You may even choose to combine your butterfly with other images within the group, such as flowers, symbols or fairies. Butterflies and dragonflies are frequent pairings in tattoos, as the two insects are often seen together in nature. Groups of images can be placed anywhere, depending on the size, but really shine when they are given space to spread out. Locate them between the shoulder blades, on the lower back, hip or upper arm so they have plenty of room. The Celts have a long and intimate history with butterflies, which leads many to consider merging the two into one tattoo. From using shamrocks as wings, to substituting butterfly wings for angel wings on the back, there are countless ways to show your Celtic pride with a butterfly tattoo. Consider placing a Celtic butterfly somewhere prominent, such as the chest, neck, foot or shoulder so it can be easily seen. Another variation on the Celtic butterfly is a butterfly made out of a Celtic knot. Knotwork is made of one continuous line that loops around to create a design. The butterfly's symmetrical wings make it the ideal creature to be done in knotwork. Celtic knots can be intricate, or loose depending on the design. Try wearing one on your wrist where your eye can trace its pattern, or on your lower back where the symmetry can really come alive. Before choosing any tattoo, it's a good idea to be aware of the symbolism behind the image. Butterflies have positive symbolism that tends to appeal to women. A butterfly is a symbol of beauty. The butterfly as a species is widely considered gentle and feminine. This ideal aligns the butterfly with beauty. Butterflies are also beautiful creatures. They have a great many colors and designs on their wings that are striking to look at, both in person as a tattoo art. Before a butterfly is a butterfly, she is a caterpillar. Butterflies start out as small, larvae type bugs. After a period, they go inside a chrysalis and come out as a fully grown butterfly. This literal change can symbolize figurative change for many people. A change in ones lifestyle, appearance, love life, or personality often prompts a person to get a small butterfly tattoo. Butterflies are graceful creatures. In Japan, a butterfly often symbolizes the grace of a young woman. 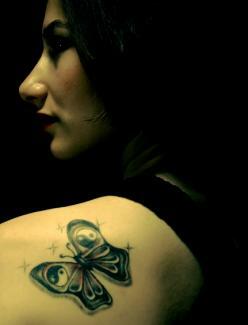 For this reason, women of Asian heritage often choose the butterfly for their first tattoo. Whether you plan to design your own butterfly tattoo or choose from a predesigned piece of tattoo flash, studying various butterfly designs can help pin down your choices. The following websites offer thousands of free butterfly designs you may want to consider. Tattoo-Designs-Free.com: If you prefer a touch of realism over a stylized butterfly design, take a look at the offerings available at this site. You'll find full-color images of real butterflies that you might spot outside your window. FreeTattooDesigns.org: In addition to the designs, this site also provides background information associated with butterfly tattoos as well as body placement ideas and photos. You can also review a list of celebrities who are tattooed with butterflies on the site. 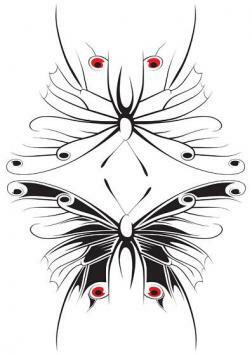 Tattoo Easily: This site features 95 free butterfly tat designs. The designs feature traditional looking butterflies as well as white and gold ink, stylistic butterflies, and tiny designs. EuroTattoo.co.nz: Not all of the designs available here are tribal, but they are typically large in style with dark, heavy lines and shading. Images show a nice mix of ideas for black ink and color work. Choose from two pages of designs. Butterflies may be a popular tattoo image, but their incredible versatility ensure that your tattoo can be as unique as you are. Colorful or tribal, let your tattoo take flight with a pair of butterfly wings.